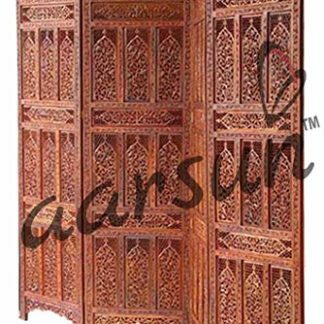 Aarsun Woods present you with Handcrafted Foldable Partition Screen adding a touch of elegance to your living room. Folding Partitions are mostly used to separate a space from the rest of the house. It can be used in Puja Room or as a Privacy Screens. Moreover, these screens adds a traditional look when placed in your living room / drawing room. 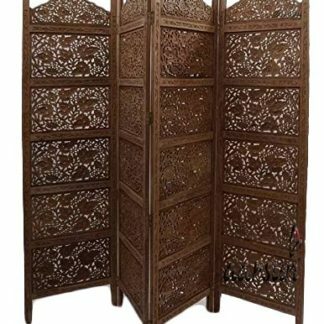 Wooden Room Divider and Partition Screens are elegantly used as Home Decor and Antiquities. We have a number of designs available in Partition Screens that can be extended as per your convenience. Room Dividers are made of MDF (Medium Density Fiberboard) , Mango Wood as well as Sheesham Wood (Indian Rosewood). The Carving and the polishing on the Wooden Partitions are done by skilled craftsmen. Sheesham / Indian Rosewood is also used in marine and aircraft grade plywood. Sheesham / Indian Rosewood is perfect for making antique furniture for homes and for offices as it gives a very smooth finish to the product.